Undoubtedly Oregon’s monthly employment reports have been less than stellar in the past handful of months. The unemployment rate has risen each month since April, although it’s back on track with it’s trend since the depths of the Great Recession. Conversely, job growth has been erratic to say the least. May saw no net job gains, June was weak and then the latest report for September showed recession-sized job losses. If accurate, these reports indicate a significant slowdown in Oregon’s labor market in recent months, if not worse. However there is one big reason why our office is not concerned yet: wages. Specifically, withholdings out of Oregonian paychecks. We get daily and monthly reports from the Department of Revenue. As seen below it’s noisy data — it matters how many business days are in a month, or how many Fridays, etc — growth remains very strong today. Wages did stall somewhat in the second quarter but have resumed full-throttle growth since. As discussed before, it is typical to see about one month of job losses each year during an economic expansion. Yet private sector losses of 6,600 in a single month — September preliminary estimates — are on par with those seen during the 2001 recession. We know the employment data is noisy and will be revised and benchmarked. New QCEW data was recently released and ahead of the coming forecast we will examine it in-depth at the industry level. Our office expects growth to slow somewhat from its 3.5% pace seen earlier in the year, particularly in manufacturing with the global economic weakness and strong U.S. dollar. However every wage indicator we have, including that just updated QCEW data, shows continued strong growth, not a deteriorating labor market. Well, every wage indicator except for one. Average hourly earnings for all workers has barely budged at all since its inception just prior to the Great Recession. Average hourly earnings for production workers, which has been around forever, is growing at about the same pace as BEA average wages (or QCEW average wages) which are trailing the gains in withholding per job. 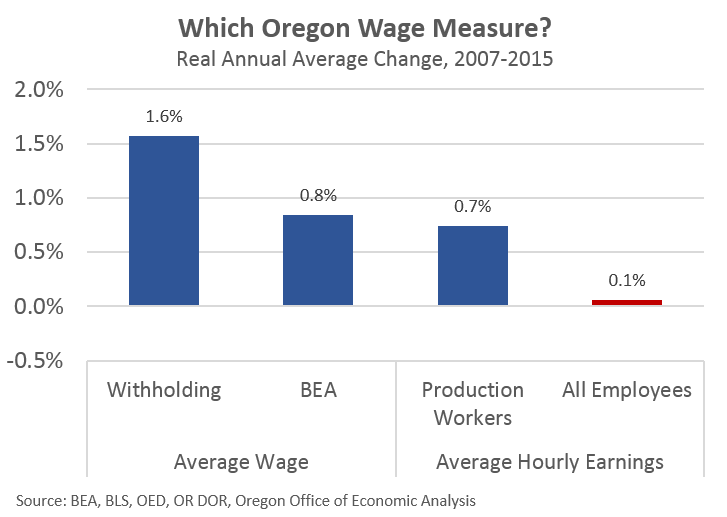 Oregon is seeing significantly stronger wage gains than the nation. Our average wage today is the highest its been — relative to the national average — in at least a generation, or since the mills closed in the 80s. Again, except the one new data series that had barely changed at all. We cannot discount that series entirely, but it’s preferable to see how economic data changes over a couple of business cycles so that we have at least some idea of how it responds to a changing economy. 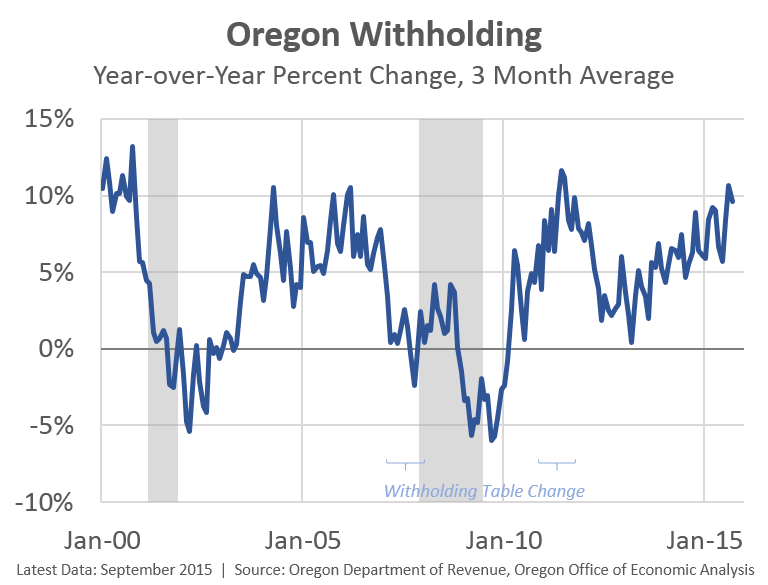 For now, our office believes the Oregon economy remains on track, evidenced by the strong wage gains. Our office is more concerned by slowing withholding, if it comes to pass, than a few subpar movements in the jobs data, prior to their revision. Now, monitoring both are certainly important and we do, along with our advisors. Should wages weaken, and the subpar employment reports continue, then we will become worried. Our next forecast is set for release on December 2nd and the above will certainly be part of our advisory meetings in the coming weeks. For the record, I used core PCE to deflate the wages from nominal to real.